The sea floor sediment and the benthic (sediment-dwelling) organisms which live there are key components of the Puget Sound ecosystem. Among the ecological functions they serve are the processing, storage, and release of nutrients. Changes in the habitat and organisms can indicate responses of the ecosystem to stressors. Therefore, it is important to know not only current conditions, but also changes over time. Because benthic organisms are in constant contact with the sediments, and a very large proportion of them ingest sediment to obtain their food, they are a biological endpoint integrating any contamination in the sediments. 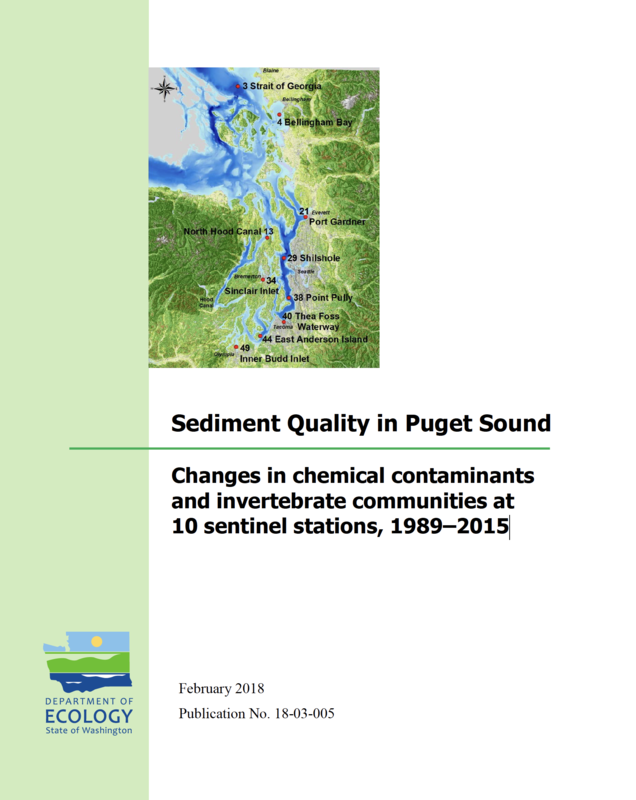 This report covers results from 27 years of sampling sediments and benthic invertebrates at 10 long-term stations throughout the greater Puget Sound area every year from 1989 through 2015. These 10 stations represent different habitat types and distinct benthic communities. Overall characteristics of, and trends in, the habitats, sediment chemical contaminants, and benthic invertebrate communities, as well as relationships between them, are presented. Results are placed in context with broader-scale bay and region sediment monitoring results. Although there were significant increasing or decreasing trends in a few parameters at a few stations, the most common pattern was lack of monotonic (consistently increasing or consistently decreasing) temporal trends. • Sediments and the invertebrate communities inhabiting them have largely remained stable over time. • Profound changes in the invertebrate communities occurred at Sinclair Inlet between 2000 and 2001, and at Anderson Island in the late 1990s. More-gradual changes were found at several other stations. • Little to no relationship was found between invertebrates and measured sediment contaminants. • Sediment chemistry patterns were generally consistent with those observed at wider spatial scales. • Changes in benthos seen at wider spatial scales were generally not found at the long-term stations. • Even though species and abundances may vary considerably over time, in stable systems ecological functions are conserved.